The Scottish word “dreich” has no direct translation but it perfectly describes the weather on Wednesday: wet, grey, miserable… What better day to go out for a drive in my friend’s new car? Our journey took us along Loch Lomond, across to Arrochar and Loch Long then across the Rest and Be Thankful pass to Loch Fyne and Inveraray. Despite the weather it was a spectacular drive with the mist clinging on to the tree tops and the lochs the colour of unpolished pewter. It only took us about an hour to get to Inveraray and by the time we arrived the rain had more or less stopped. We passed the castle on the way in – home to the Dukes of Argyll and an impressive looking building. If you watch Downton Abbey, Inveraray starred as Duneagle Castle in the 2012 Christmas episode. We didn’t have time to go to the castle so I will go back and visit when I have a day to spare. Instead, we chose to visit the jail which stands out as one of the few buildings in town not painted white. It was very impressive from the outside and I was surprised that it was right in the town centre next to the loch, although I soon found out that it was a court house as well as a prison. The jail is an interesting mix of information boards, wax models and real people in costume playing prisoners and gaolers. The first section was all about crime and punishment and was quite gory. A minor theft could be punished by having your ear nailed to a post while for a more serious theft you could have the letter T burned into your face with a hot iron and be beaten in public. A nagging wife would be forced to wear an iron “scold’s bridle” which had a metal piece that fitted under your tongue and iron bars to hold it like a mask over your head. From there, we moved into an actual trial with recorded actors and wax figures. There was room for you to sit down and listen and there were several different cases being tried. I could have sat there for hours but we had to move on and into the exercise yard and the prison itself, both old and new. It took us a good two hours to go round and see all that had to be seen. 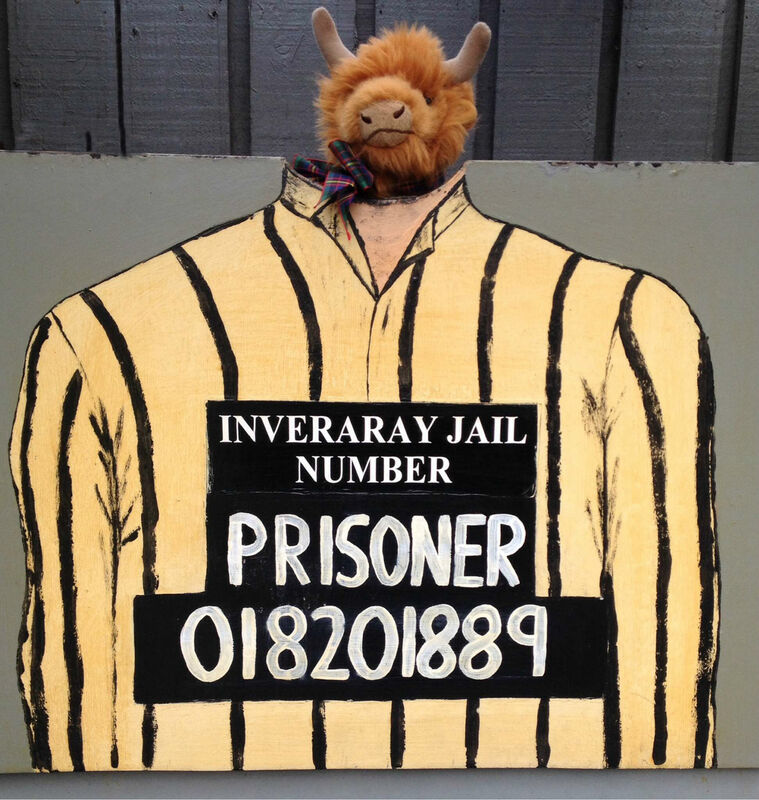 My friend, Wee Rab, was with us and he had a whale of a time running round, trying out the punishments and chatting with the warden and one of the prisoners. He was given a parole card with the rules of the prison on the back and the space for four stamps on the front. He had to find the stamps in the various rooms and then present his completed card when we left so that he could have a badge. This entry was posted in Inveraray, Places and tagged Crime & Punishment, History, Inveraray, Inveraray Jail. Bookmark the permalink.